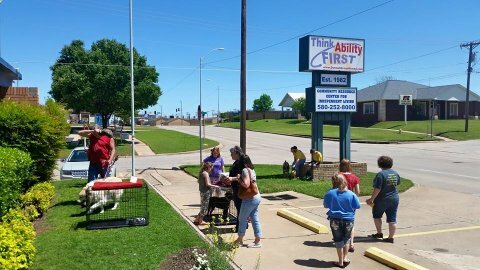 Opportunity Details | Think Ability Inc.: Think Ability Inc. The person in this position provides day to day opportunities which support and guide individuals with disabilities in achieving personal goals for maximum living. This can involve modeling productive behavior as well as teaching life improving concepts and day to day functional skills. It also involves introducing and supervising individual activities necessary for routine living, personal and home care/safety. As a part of regular activities will expose and involve individuals in social activities, community resources, and other opportunities for interaction/development. This person is an active participant in the individual's care and development team discussions. Taking initiative to suggest new and or improved methods/activities for support and growth is expected. As a member of the team, this person must work cooperatively with all team members within the work environment to ensure individuals receive the right support and protection. The work requires full and consistent communications daily and producing/maintaining essential records/documents as prescribed by contracts and company guidelines. $8.50 starting $0.50 raise once all training is complete. Work Days/Hours: Evenings and weekends shifts vary. You can fill this application in on your computer, save it and upload with your inquiry.